CHICAGO, Ill. — The customary chant from United States fans of “I believe that we will win” was quickly made too redundant for the home crowd to keep echoing in Costa Rica’s nightmarish 4-0 loss in Copa América group play Tuesday. 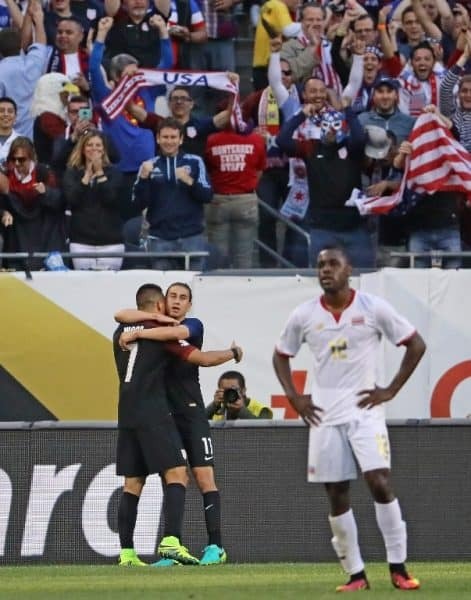 “La Sele” was beat down from the beginning of the Group A match against the U.S. once Clint Dempsey converted on an early penalty kick in the ninth minute. The Ecuadorian referees booked Tico defender Cristian Gamboa for shoving Bobby Wood in the box. Wood did a good job of selling the penalty, but it wasn’t an atrocious call by any means. 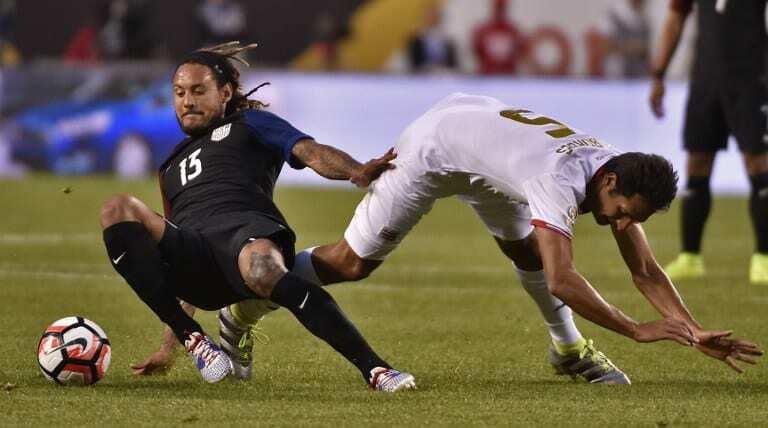 It wouldn’t matter anyways, as the U.S. quickly became the aggressor and scored two more goals in the half when Wood and Jermaine Jones connected on open shots near the end of the period. Once again, Costa Rica failed to materialize anything in the front of the field. Marco Ureña came off the field in the 17th minute with an apparent injury and substitute Álvaro Saborío was quickly rendered useless. This team’s star offensive trio of Joel Campbell, Bryan Ruíz, and Celso Borges failed to appear for a second straight match. Costa Rica is not talented enough to afford any of those three playing poorly, let alone all three at the same time. In the 55th minute, Borges came close to scoring a goal, but chipped the shot just over the top bar. Later on, Ruíz somehow missed a wide open shot with a header that veered from its path on goal towards the left post, providing one last clank for Costa Rica. Patrick Pemberton, Costa Rica’s third string goalie, needs to be given credit for holding up strong in the first game against Paraguay. But the 34-year-old keeper was exposed versus the U.S., coming too far out of the net and being too slow to react on the game’s second and third goals. Star goalie Keylor Navas was missed, as was suspended center back Kendall Waston, who could have helped plug the middle of a defense that the U.S. exploited on multiple occasions. Neither player would have made this a different result, though, as Costa Rica was beat on every level. The worst loss of the Óscar Ramírez era came on the biggest stage in a must-win game. Fortunately for him, Costa Rica is doing well in World Cup qualifiers in a somewhat complicated group. But, at this rate, La Sele’s glaring problems may extend well beyond Chicago’s Soldier Field towards the 2018 World Cup in Russia. Even in victory, this team has been devoid of a consistent offensive attack while relying on a five-man backline. What’s more discouraging is trying to look beyond the current roster for any possible reinforcement in the national system’s front. Young forwards John Jairo Ruíz and David Ramírez have not panned out the way anyone in the country could have hoped. Ariel Rodríguez, who was kept off this roster with an injury, showed promise with a goal in La Sele’s pre-Copa friendly against Venezuela, but he, too, lacks the consistency this offense needs. Ramírez’s defense shouldn’t be immune from reform, either. Though the talent is in place with a solid bookend of wing defenders Ronald Matarrita and Cristian Gamboa, this defense lacks the discipline and effort that made its improbable run through the last World Cup possible. This group has played with little urgency in World Cup qualifiers and recent friendlies, and that passiveness was on full display Tuesday when a very average U.S. side carved up the Ticos. It was the “group of death” that Costa Rica conquered in the 2014 World Cup, and two years later it’s this tournament’s “group of death” that put a dagger through La Sele, possibly piercing through the team’s biggest flaws.